The stock 2 injector throttle body injection is poorly designed but it is what you have to work with unless you want to jump in and go to a complete new F.I. system. We have been successful in working with the stock system in applications up to about 320 hp although the driveability is not all it could be. The stock system is notoriously unreliable and difficult to troubleshoot and even more expensive to repair. DO NOT attempt any upgrades to your car if the injection system is not working properly. You will lean out or detonate and cause yourself much more expensive problems. Make the car run good before you try to make it go fast. The first problem most people encounter when working on or troubleshooting their F.I. system is establishing fuel pressure and volume. It seems no one has the tools and most repair shops don t want to deal with these cars. You need to know if the car is rich or lean before you can figure out what to do to fix or upgrade it. To this end we offer a couple of good diagnostic and tuning tools. You also need to establish fuel volume, this will tell you if the fuel pump, pickup or fuel filter are restricting the amount of fuel to your engine. You need at least 25 gallons per hour @ 45 psi to run under boost. This is easily measured by taking a container of known size ( like a 1 gallon plastic bottle ) and running the fuel into it for 1 minute and multiplying by 60 for a 1 hour flow rate. A 90-150 GPH rating is even better, this is the reason for upgraded pumps. Fuel pressure plays a big part in tuning the system. If you cannot change the length of time the injector opens ( as with the stock system ) then raising the fuel pressure will let more fuel in during that time with the added advantage of a better spray pattern and better atomization. Rising rate boost referenced regulators are the best way to accomplish this since the stock regulator does a fine job of running the car at low speeds and off boost. We use an additional rising rate regulator inline with the stock regulator to increase pressure in a linear fashion from 5 psi boost to 18 psi. The amount of pressure varies with the output of your pump or pumps. Replacement BOSCH High volume and High pressure fuel pumps are a great safety item and will assure you of having enough fuel available at all times. A must if you are going to run a Nitrous system and the only way to go to replace a bad stock pump. Mass Air Sensor Mods: This is something to try. Remove the cardboard and the honeycomb from the mass air sensor. The cardboard is easy but the honeycomb requires a bit more finesse. You want to carefully cut the honeycomb out so that if your car does not respond favorably you can epoxy it back in. Although it flows quite a bit more air but on some cars it will cause a poor idle condition or after a hard boost run it will surge when it comes back to idle. If these problems annoy you too much put it back to stock. You will notice a power gain and if the idle problem is something that you can live with, then it is a free bit of HP. This is the very best way to diagnose and trouble shoot your fuel system and to monitor your system for possible lean conditions under higher than stock boost levels. A must for tuning any programmable management system. A stand alone replacement for the stock pump. Good for systems up to 350 HP. A direct replacement for the stock pump. A stand alone replacement pump for systems up to 500 HP or any 4 injector or AIC system. 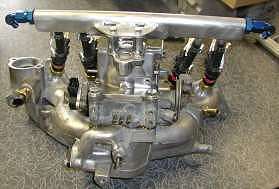 This is the pump that comes with our 4 injector conversions and AIC kits. This is the system we use for the 1986 Cars when we get past the Boost Cut limit to give the extra fuel needed...Also works excellent on the 87-89 cars when running a large Turbo and 15+ psi boost. Note: This package adds 2 extra injectors into the existing system. It does not replace the stock F.I. in any way. Same baseline as the stock regulator so it will no affect your off boost and low boost driveability. An easy to install unit that does exactly what the bigger fancier regulators do at about the price. Also makes a great stand alone regulator if you want to eliminate the stock one or are going to a stand alone management system. A handy inline mechanical regulator that will enable you to raise your baseline fuel pressure incrementally to the limit of the pumps output. An easy way to cure off boost lean spots. Can be used with any rising rate regulator. Stock Factory replacement fuel injectors. They come with new seals and new injector connectors. These little connectors are the source of so many problems in a StarQuest it should be the very first thing you replace when you buy one or are having any driveability problems. This is the plastic connector with the electrical terminals and a 6 pigtail of wire. Ours are the quick release style so you do not need to pick the little U clips to remove them. Just push and release. Solder new wires onto your harness and off you go. Be sure and THOROUGHLY CLEAN your injector terminals with a small file or piece of sandpaper to insure good contact. This is the best way to do this. K&N element in the stock air box. Drill a bunch or to 1 holes in the airbox or cut one large panel out on the side away from the turbo and the face. Keeps intake noise down and admits quite a bit more air. Cheap, Easy , and the filter is washable..Leave the cold air inlet from the fender in place !!!!! Coolant temp sensor for F.I.